In our very cores we are love. We are made from love. Everything that God has ever done for us, is because he loves us with such an Eternal and Everlasting love that we cannot even begin to imagine. He loves us, each and every one of us unconditionally no matter what we do or say, and He wants us to be like him (through our thoughts, words and actions) and to become like him (Exalted Gods and Goddesses in our own right). Everything starts with love. The more genuine and real, Divine love we feel within and for ourselves, the more of that same love we can feel for and share with others. When we come from a place of love we are better able to shed the layers of who we are not so we can become who we are truly meant to be. We do this, a little more, a little better each and every single day, we will become as Gods in mortal forms. 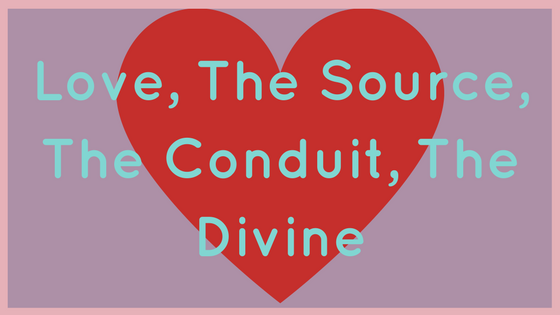 We must first love the Divine. We were created by God. He is the literal Father of our spirits. We must also love ourselves and all mankind. He created us and the whole of mankind. If He created all of us, then we are all worthy of love. I am of the opinion that if we followed these two great commandments, we would have no need for laws to be written down, such as the 10 commandments and the laws of the land. We would not need them to be written down because if we always come from a place of love, we will naturally be keeping those commandments and laws anyway. There would be no abuse, murder, stealing etc. because every human on earth would be coming from a place of genuine and Godlike love. Perhaps, for some, it is hard to love (or even believe in) a being that they cannot see or experience with the five physical senses. In that case, I would suggest that we must first honour and love ourselves before we can honour and love our fellow man before we can truly honour and love the Divine. The world is simply a mirror reflection of ourselves. If we cannot love ourselves enough, we will struggle to genuinely love others which in turn means we will struggle to have a true connection with the Divine. Because the Divine is simply love. Our feelings of worthiness can only come from within. We must first learn to validate and give attention to ourselves before we can expect to receive or even, in most cases, accept validation and attention from others. Have you ever received a compliment but shrugged it off saying something like “I’m not that pretty” or “I’m not that talented”? This is because we cannot yet validate ourselves. We can’t seem to give ourselves the love, care and attention that we need so we reach out for others to get it when it should really be coming from within. But if/when we do get it, we push the compliments or the people away from us. Self-love is not selfish or narcissistic. True self-love is selfless. How can you help others if you cannot help yourself? Quite simply, you cannot. If you look within to find your answers, you must also look within for your source of strength. Think of yourself as a cup. The water in the cup is your energy. If you are running on empty, you cannot give your energy to another, through any kind of service, because you have none to spare. First focus on refilling your cup. Refuel your body, mind and soul. The more you do this, the more your cup is filled. The more your cup is filled, the more it overflows. Take care of yourself first and it ripples out into your immediate sphere of influence, which in turn ripples out into the world. How do we fill our cups? We do this by taking time out of our busy schedules and setting aside some personal, high quality me-time. We focus on nurturing ourselves, spiritually, emotionally, intellectually, physically and by standing up for ourselves and saying no to people, places and things when necessary to protect our energies. We learn and we grow in all these things, in order to have a truly satisfying and complete human experience. And we do this every single day. If even for just 1-5 minutes at a time. We jealously guard our time to recharge, because it only means we can give more of ourselves to others. We strengthen ourselves first, because it only means we can go on to strengthen others. It is my hope that, through reading these past few blog posts, you can come to your own realisation of who you truly are and why you are here. There is always hope. There is always a reason why we go through such horrible things. But imagine a world, where we no longer have to go through these things, a world in which we understand why we went through them. I mean truly understand and appreciate where we are now, what we have achieved because we overcame every single stumbling block that was placed before us. Imagine shining brightly. Loving fiercely. Imagine a world in which you can create your own worlds without number, standing side by side with your spouse as husband and wife. As equals. As King and Queen of your own special corner of heaven. I love you all. God loves you all. Let us all cherish ourselves and each other as the most sacred, most Divine beings we truly are. Without first recognising the source of our Divinity we cannot hope to ever achieve our full potential. We need man and woman. In harmony and balance. Husband and wife. Otherwise we cannot hope to achieve our highest potential. So awaken to who you truly are and first look within for those answers. That knowledge is within you. It always has been. Always will be. You have just forgotten it and that too is by Divine design. Be open, be receptive, be willing to act upon what you learn, and I promise you, life will take on a brand new meaning. There is always hope and you are always loved. You are so worth it.